You are going to love this healthy version of Thai Peanut Chicken Pasta! 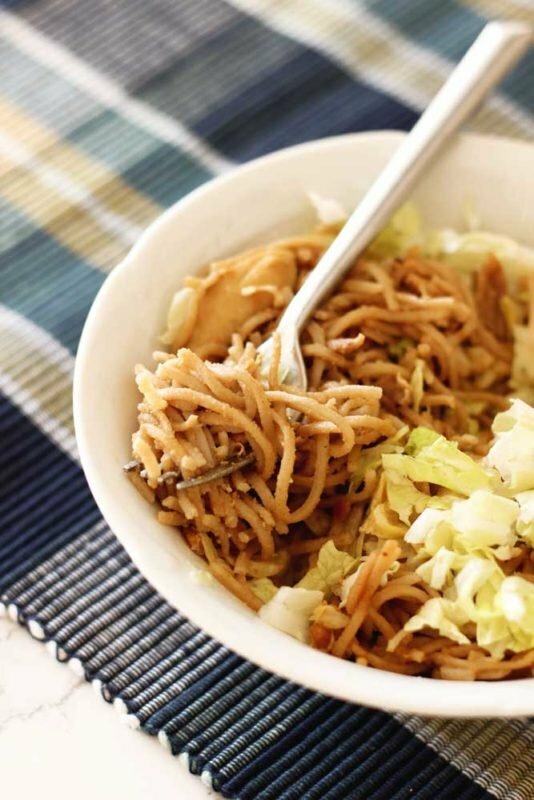 This Thai Peanut Chicken Pasta recipe uses a healthier noodle, contains high levels of protein and added cabbage! Full of flavor, you’re going to love the crunchy peanut taste of this healthy dish! My husband asks me to make this recipe for him all the time. Outside of my 10 Garlic Clove Marinated Grilled Steak recipe, this Thai Peanut Chicken Pasta is his favorite dish I make. If you like peanut butter…you’ll love this recipe! I found this recipe years ago from The South Beach Diet and it has stayed a regular recipe in our house! 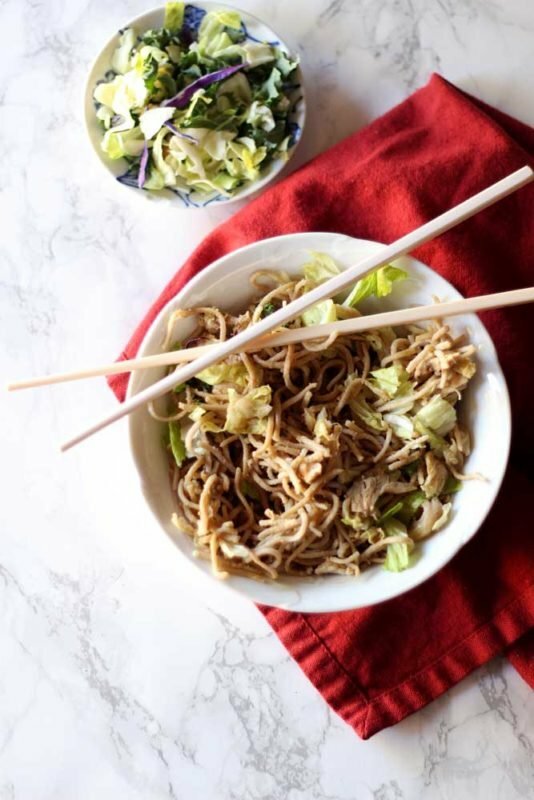 This one is really fast and easy to make, but you may need to head to your local grocery because this delicious pasta dish calls for ingredients that you may not have in your kitchen…like napa cabbage, dark sesame oil, rice vinegar and soba noodles! I use soba noodles in this dish because soba noodles have some great nutritional benefits! Soba noodles are a great source of fiber and they are lower in calories than your typical pasta. But let’s take a minute to talk about soba noodles because some brands of soba noodles are gluten free and some are not. If the soba noodles you buy are “pure buckwheat noodles” then you are good…those are gluten free. Read the labels on the package to ensure you know what type of soba noodles you are buying. Eden Foods makes a 100% buckwheat soba noodle and I highly recommend their brand. You can check out the kind I use in this Thai Peanut Chicken Pasta here: Eden Foods Soba Noodles. If you are not gluten free and you are not interested in soba noodles for this dish and you want to make this Thai Peanut Chicken Pasta with regular wheat pasta, use linguine. I’ve had people ask me about using quinoa noodles in this dish. I don’t recommend making this Thai Peanut Chicken Pasta dish with quinoa noodles. Quinoa is naturally dry and the pasta needed for this dish needs to have some moisture! Ok, fun fact of the day….buckwheat is not a wheat but rather a plant in the carrot family. It is the seed kernels of the flowers, is naturally low in fat, high in iron, and gluten free! You’re going to love this recipe and I love that this pasta dish is healthy! A healthy pasta dish…who’d have thunk it! And with that…Happy Eats! You are going to love this healthy version of Thai Peanut Chicken Pasta! 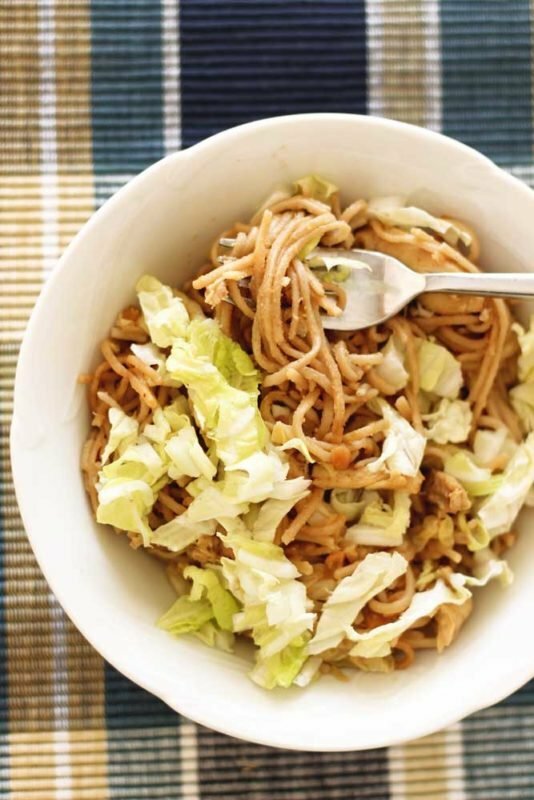 This Thai Peanut Chicken Pasta recipe uses a more healthy noodle, contains more protein and added cabbage! Full of flavor, you're going to love the crunchy peanut taste of this healthy dish! Season chicken well with salt and pepper and toss with 1 tsp of dark sesame oil. Heat skillet over medium-high heat; cook chicken until browned and no longer pink in the middle. Cook noodles according to package directions; run under cool water and drain. While your noodles are cooking, whisk together peanut butter, soy sauce, rice vinegar, water and remaining dark sesame oil in a large bowl. Thinly slice cooked chicken and add to peanut butter mixture. Add cooked noodles, napa cabbage and scallions to the peanut butter mixture. Toss gently with tongs to combine all ingredients and serve. NOTE - To make this recipe even easier and faster than it already is, use pre-cooked shredded rotisserie chicken instead of cooking the chicken breasts! Pin this Thai Peanut Chicken Pasta recipe to your favorite PASTA board on Pinterest! You had me at Thai Peanut – I drooled right after I read those words that it could have been Thai Peanut slathered cardboard and I’d be raising my hand for a taste. But, since it is a pasta dish with chicken in it, all the better. This dish looks so delicious that I know I’ll be making it in the very near future!! This one is a WINNER!!! You are going to LOVE this dish! It’s amazing and a huge crowd pleaser!! Yeah! I hope you love it!! this is something i could see myself eat everyday.. love the combo of peanut butter + sriracha! It’s my husband’s favorite dish!! he wishes I’d make this for him everyday!! I like soba noodles and the peanut flavor and crunch in this dish! I will just skip the chicken for me and leave it for my husband! Yes! You can easily make this a vegetarian meal!! I just set some chicken out to thaw with plans of making some sort of pasta dish for supper. You must have read my mind because this looks perfect! Yes, it’s the perfect meal and you’ll love it!! thai anything is my favorite! saving this to try later. This looks delicious! I would substitute tofu for the meat, but that’s just because I am vegetarian. I never thought to try soba noodles in a thai dish. Yum! Both things that I love! I love the idea of substituting tofu for a vegetarian option!!! Great idea! Love the crunch of the cabbage in with the soba! And the peanut sauce sounds delicious. Yes! The combination is super amazing!! 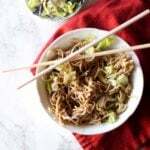 I love the idea of using soba noodles over traditional noodles, I try to eat really healthy in between my more decadent meals. I am going to save this for later, thanks for sharing the good info! Absolutely! I hope you enjoy!